For various reasons, my husband and I stuck close to home in 2015, but that doesn’t mean our desire to travel has diminished. Being home-bound for so long, though, means that I’m feeling especially nostalgic for past adventures. Maybe it’s on account of all the Christmas Market and Hogmanay photos I’ve seen on travel blogs and social media lately, but I keep finding myself thinking especially of my 2014 trip to Edinburgh. Edinburgh is rich in history and culture, and there’s no shortage of great places to eat and especially to drink. I really can’t begin to do justice to the city’s bar scene here, so instead, I’ll offer a sampling of what’s in store for travelers through the lens of four of my favourites. The Short: A casual, comfortable sports bar with a good selection of Scottish beer and whisky. The kind of place you’d make your local, if you’re lucky enough to live nearby. The Environment: Low-key, unpretentious, and bright, with white walls, exposed brick, and dark wood accents. And if you’re hungry, pop downstairs to Teuchters’ sister restaurant, A Room in the West End, an excellent, cozy bistro that caters to a variety of palates. They make a very tasty vegetarian haggis — try it with the caramelized shallot relish! The Service: Helpful, direct, and attentive. The Drinks: If it’s Scottish-brewed beer you’re after, this is the place for you! In addition to their house blonde, they have a few draughts you’d expect, like Belhaven Best and Innis & Gunn Lager, and a few you may not have even heard of, like Deuchars IPA, Williams Bros (who brew the delicious Fraoch Heather Ale! ), and West 4. There are also rotating keg and ale selections. The Short: Conveniently located on Old Town’s main tourist street, Whiski Bar is the perfect spot to unwind with a drink after an afternoon of shopping or sightseeing. We enjoyed it enough to visit twice. The Environment: Traditional Scottish pub with a contemporary twist. Unsurprisingly, a wee bit touristy. The Service: Despite making repeat visits here, I hesitated momentarily to include Whiski Bar on this list on account of the service we received. Overall it was perfectly adequate, and while he wasn’t rude, the English bartender who served us on both occasions was not exactly warm or friendly. That said, there’s far more to recommend Whiski Bar than there is not. The Drinks: Wine, beer, cider, whisky — what tickles your fancy? Whiski Bar has a bit of them all, but true to its name, a lot of the last. I didn’t have the same thing twice! The Short: Crowned “Best International Restaurant Bar” at Tales of the Cocktail 2014, this New Town cocktail bar and restaurant is elegant and approachable. While you’re in the neighbourhood, be sure to check out The Bon Vivant’s Companion next door for booze, bitters, and barware (both vintage and new). The Environment: Warmly lit, bohemian chic, with lots of nooks in which to cozy up for intimate evenings of food, drink, and conversation. When we were there, the room was peopled with young professional and artistic types doing just that. 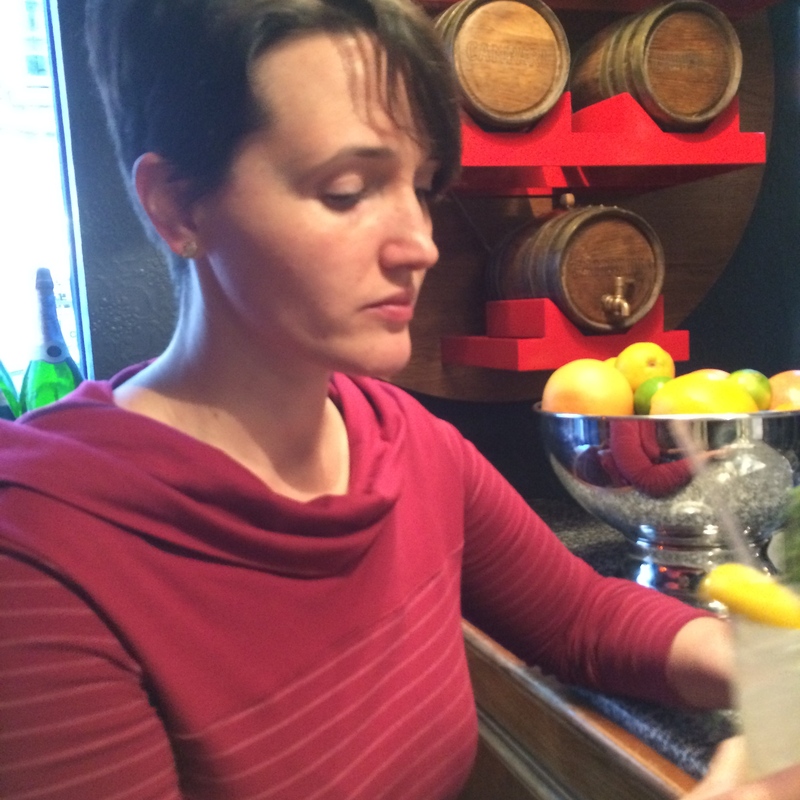 The Service: My husband and I sat at the bar, and were very well attended by a personable bartender who neither hovered nor let our glasses go dry. The Drinks: Cocktails and the bartenders who make them are the stars here, and for very good reason. The two lemon-tinged cocktails I sampled are a testament to the creativity and craftsmanship that go into a top-notch cocktail program. I neglected to record the name of the first drink, but it was an incredibly refreshing mix of gin, lemon, thyme, and — if memory serves — soda. In writing this, I realize that this sounds a little similar to a gin and tonic, but it was more herbal and, more importantly, exactly what I needed after the long drive from the Highlands in a cramped bus. The second cocktail, the Highland Shrub, was even more impressive — so much so that I made note not only of its name, but of its ingredients, hoping that one day, when I’m a much better bartender myself, I’ll be able to approximate the drink I had that day in September 2014. It may have just been a daily special, but the Highland Shrub — a mix of Dewar’s 12, white peach and clove shrub, Cointreau, lemon, and soda — is the kind of cocktail this woman could get used to! I would have lingered longer at The Bon Vivant but for our dinner plans at Henderson’s Bistro, an excellent vegan restaurant only a few doors away, at which we ate twice in as many days. The Short: Owned by the same folks who created The Bon Vivant, this whisky-lover’s gem is tucked away just off the Royal Mile and well worth the effort of learning to navigate Old Town’s warren of closes! The Environment: Rustic, natural-finished woods and sand-coloured exposed brick warm the industrial finishes, creating ambiance that is both sophisticated and welcoming. The Service: Staff are friendly, patient, and knowledgeable, which is key, I think, to enjoying any bar with such extensive cocktail and whisky lists. The Drinks: Though I did start my evening with a very tasty cocktail, the whiskies I tried were far more memorable. Here, I sampled two drams I hadn’t seen anywhere else in my travels through Edinburgh and the Highlands: Fettercairn Fior Limited Release and Knappogue Castle 1995. For those of you interested specifically in whisky: both of these drams are lovely, and I’d buy bottles of them if given the chance. The Fettercairn — that’s it in the photo at right (or above, depending on your device) — is amber in colour, with caramel and a soft peatiness on the nose. And on the palate? Honey and milk chocolate melt into a buttery finish. As for the straw-coloured Knappogue 1995 — the only non-Scotch I drank while I was in Scotland — the nose marries the best-quality extra virgin olive oil and honey, while the palate is, for me, all honeyed cereal. Delicious! Though The Devil’s Advocate’s whisky list is long, if my enjoyment of the Fettercairn and Knappogue is any indication, it’s also well curated. This entry was posted in Natalie recommends, travel and tagged Edinburgh, food and drink, Scotland, travel. Bookmark the permalink. I began reading this article for more academic purposes – not expecting to know any of the places, having stuck relatively close to the royal mile on my brief visit. But then, second on the list, Whiski Bar – a place I’d seen online before travelling to Scotland! I google mapsed how far it was from my hotel and found, to my immense joy, it was a twelve second walk away! Score! And – AND – I tried the regular Fettercairn Fior for the first time at this bar. I know it’s a different place to where you mention having the limited release, but still – just a little spooky! Spooky coincidence indeed, Nick! How did you enjoy Whiski and the Fettercairn? It was a fun evening in Whiski. The Fettercairn was a pleasantly delicious surprise. 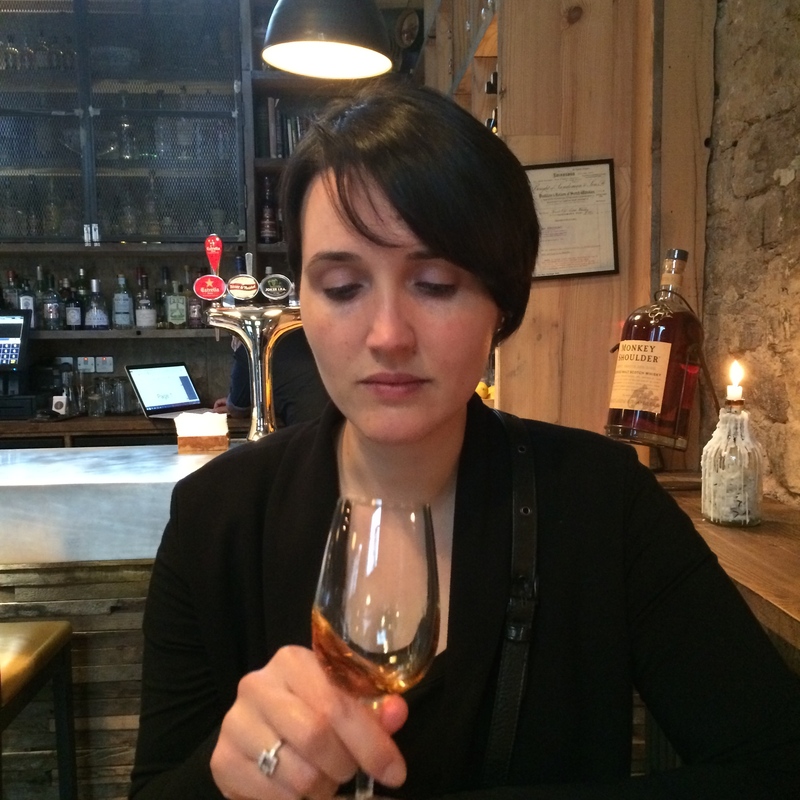 I also tried some English whisky – and made the Scottish bar staff very happy by decreeing it to be awful! Hear, hear on the Fettercairn! Do you recall the name of the English whisky? Just so I know what to avoid?